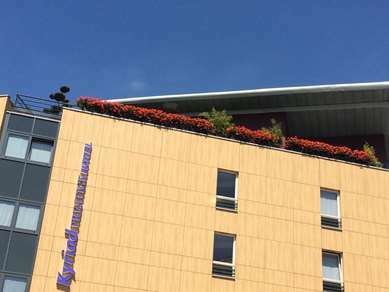 Opened in 2011, our 3-star hotel offers and astonishing design dedicated to the world of the automobile. 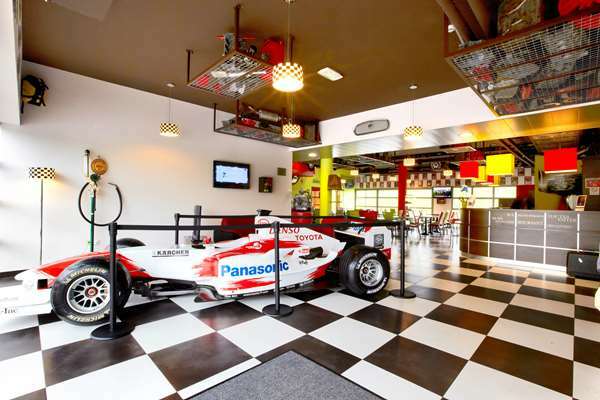 You will find yourself immersed in a race car stand with car accessories hanging from the ceiling, engine blocks as coffee tables and a real sports car on display. In addition to these special rooms, the hotel also has a lounge, bar, restaurant, fully equipped meeting room and sauna-steam room (treatments and sensory showers available to all guests). 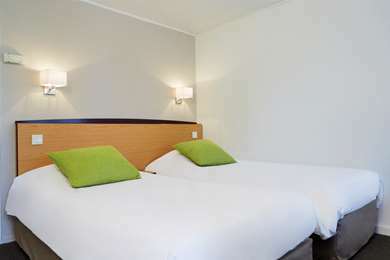 In addition, there is a gym and Kinépolis cinema complex just 100 yards from the hotel. Easily accessible by highway A31, we’re located 25 miles from Luxembourg Airport and 30 minutes from Germany. 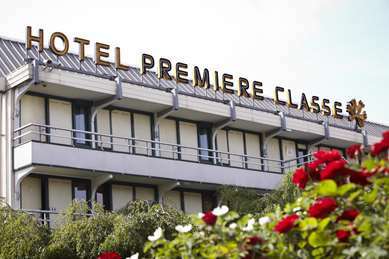 Our hotel is an ideal starting point for all your tourist excursions in La Lorraine and Luxembourg and Germany border regions. You will be able to explore the military industrial heritage of this area by visiting the Maginot Line, Hackenberg’s work in Veckring (23 miles away), the fortified site of the Cattenom woods (1.5 miles away) or the Cattenom Nuclear Power Station, just over 1 mile away. Head out to explore La Lorraine by visiting the Château de Malbrouck (18 miles away), the Château des Ducs de La Lorraine in Sierck les Bains (23 miles away), the Amnéville Zoo (12 miles away) and the Centre Pompidou de Metz (34 miles away). All our rooms combine modernity with all the amenities and high-end services: air conditioning, minibar, courtesy tray with kettle (for tea and coffee) and safe that can accommodate a laptop. You will also enjoy quality bedding with top mattress, duvet two pillows, a bathroom with large shower, toiletries and a hair dryer. The 72 rooms at our hotel, with their astonishing design as a tribute to the world of the automobile, are decorated in warm colors. 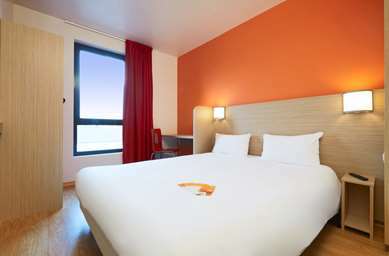 The rooms are 100% non-smoking and you can choose from a single rooms, double rooms, rooms with 2 single and triple rooms. We also offer two Business class rooms with adjoining sitting area, as well as three family rooms, connecting rooms and 3 rooms specially adapted rooms for people with reduced mobility. To get your day off to a good start, our hotel offers and an all-you-can-eat breakfast buffet. Enjoy freshly brewed coffee, Danishes, scrambled eggs, and a vast selection of other products. If you need to leave early or prefer a light breakfast, you can opt for a continental breakfast with a hot drink, juice and pastries. Modern, well equipped 4*. Excellent beds. Wifi a bit shaky and slow. Breakfast just about standard. No minibar on my floor’s rooms (3rd). Paid 77€ for the night plus breakfast which is very reasonable given the good standard. The hotel was smelling sewage. Floor was dirty. My sister got a room, I got another room on a different floor. Late at night, someone knocked discreetly bu repeatedly at the door of my sister. She had a "do not disturb" sign on. The male voice said some things my sister did not understand, and did not go away after my sister told him to go away in French and in English. She called the reception, even though she could not hear anyone intervening, 10 minutes later the man at the reception called back and told her the person at her door was drunk, and was mistaken the room. They did not change her room for her security. She was terrified to stay there alone, she came to my room and did not sleep all night. Next morning we complained, but nothing was done. We paid for the room she could not sleep in, no apologies whatsover, and the hotel manager (Laurent Giraudon) did not even bother coming to the premises to talk to us (we insisted to see him or talk to him). We would expect at least sincere apologies and change my sister's room after this alleged drunk man "mistake" which we believe was not a true story. They did cover-up the incident, it could have ended much worse. We thought about going to the police, but we were on the road for a meeting and we had to leave. We would never stay again in this hotel. We have reasons to believe the night guard acted improperly and the manager totaly ignored the basic rules of hostellerie. In short, they were rude and tried to cover or downplay the incident. Ok, so it’s a cheap stop over. Somewhere to get a nap to break up a motorway journey. I get it.. The good points are that there are plenty of good restaurants nearby, petrol station and large supermarket. Currently (start Sept 2018), you should be aware travellers are camped out in their caravans on both sides of the hotel. Nothing against the travelling community, but some do feel uncomfortable in their company. The hotel has a motor racing theme. I’m an avid F1 fan, so it was great to see Rene Arnoux’s 1989 F1 car in reception, but the rest of the hotel reception resembled a junk yard! It was just full of regular car bits and toy road cars EVERYWHERE... just junk. When we got to the room there were more toy cars inset to the desk on stained paper under cracked glass. Just weird. The hotel has a very strange odour I can only describe as a smell you’d imagine from a long travelled smoking sweaty bloke who’s splashed on some cheap aftershave to mask the smell! We didn’t sleep well at all because the windows don’t open, and the aircon doesn’t work. We had it set to ‘cool’ but it was actually spewing out warm air. Turned the whole thing off and tossed n turned in the unbearable heat. Like I said though, it was a cheap. Stopped here in 2004, looked better maintained then (maybe still pretty new) and had a less budget vibe. Still rooms were clean and staff was nice. There was some paint coming off in the showers and some of the furniture had some scratches and chips off.